The 2 x 2" Streak 1mm Filter from Tiffen is a special effects filter designed to render a single light ray from a point light source. This filter features a single series of etched lines spaced 1mm apart from each other, which run diagonally across the filter surface. When the filter is rotated, the orientation of the light ray can be adjusted to suit your composition or desired effect. The filter is constructed from clear optical-grade glass for maintained image clarity and measures 2 x 2" / 50.8 x 50.8mm. Etched lines spaced 1mm apart produce a single ray of light from point light sources, strong highlights, reflective materials, or metallic surfaces. 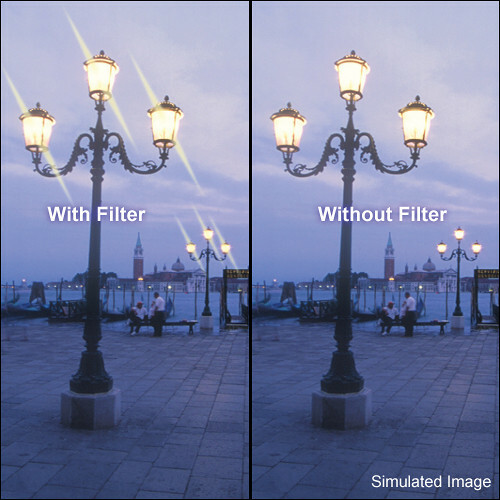 Filter can be rotated to adjust the orientation of the light streak.